Taro, also known as kalo, is one of the original canoe plants, brought from the Marquesas Islands of Tahiti to Hawaii over 1000 years ago. It was then and even today remains one of the staples of the diets of Hawaiians, especially the young where it is often used as baby food. In tales of taro's origins, it is the stillborn first child of Wakea, the sky father, and his daughter Ho`ohokukalani (daughter to Papa, the earth mother). This child was buried near the house and grew into a taro plant they named Haloanaka, or long stalk trembling. The second son born to Wakea and Ho`ohokukalani took human form and was named Haloa after his elder brother. From this Haloa the human race descended. Thus Hawaiians as a people understood themselves to be closely related to taro. Taro farming developed into a sophisticated system in Hawai`i. Hawaiian planters cultivated approximately 300 varieties of taro in ancient times, most of them distinguished by colors in different parts of the leaf and adapted to specific growing conditions and locales. Hawaiians grew both wet and dryland varieties, depending on a district's conditions and climate. Hawaiian taro is more versatile today than just being made into traditional poi. In the islands, it's also made into chips (as in potato chips) and even flour which is then used to make pancakes or bread. 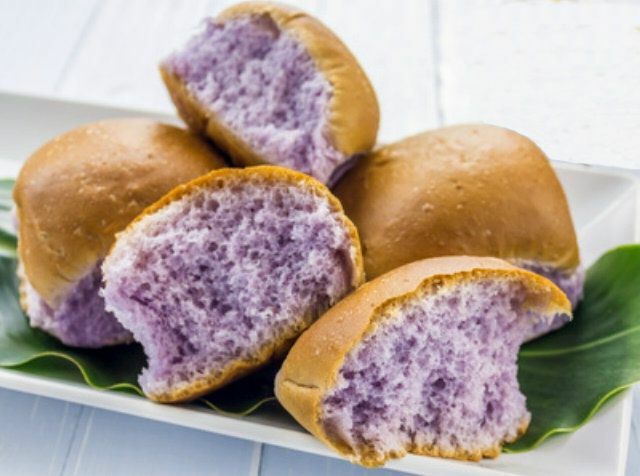 This recipe from the Polynesian Cultural Center Alii Luau calls for a delicious dinner roll form. In a mixing bowl combine egg, butter, food coloring, poi, and water. Mix all ingredients on speed 2 with a dough hook; texture should be smooth. Remove from mixing bowl and place on flour table top; roll the dough into ball size. Set aside to rise for 15-20 minutes. Line baking pan with aluminum foil and place roll taro balls 3x4. Bake at 225 F for 20 minutes.